Really great to see how this is done. I’ll have to try it out sometime. We tried the firepit technique in 30 degree F weather and that worked. Glad you posted this, I will keep it for my kids to try so they get the idea of what they need to do specifically for survival out in the woods. We live in the Arizona desert, so a lot of our brush and leaves have stickers or spikes, any ideas on how to alleviate those issues? In your basic class did you not learn learn the rule of thirds? once the shelter main stick and 2 props are in place put insulative material around the ridge pole and then lay the ribs on. Also pack it into the 2 corners on the ground. It makes it much more comfortable in the cold.And did you forget that the ribs need to be even with the ridge pole and not overlapping as in your pictures. This will make sure that all of the insulation will stay in place better and you will sleep the whole night through. Good post. More and more people need to know about this. 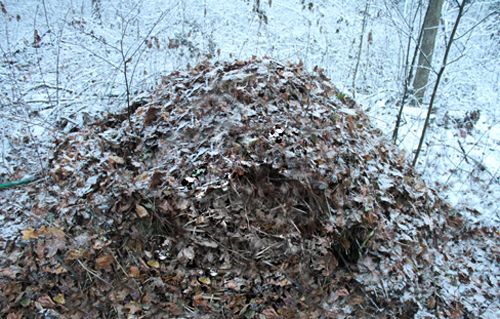 Hey nice write up, I just uploaded some photos of debris huts I built including a winter debris hut I’ve been staying in here in Indiana. I’ll get around to writing an article soon. See the photos…http://www.acwolf.com/photobooks/gallery/10/debris-huts comments appreciated. Oh I almost forgot after you get a layer of debris on about 6 inches to a foot put a layer of small sticks and twigs on then another foot of debris. This adds additional dead air space and minimizes how much debris you have to use. 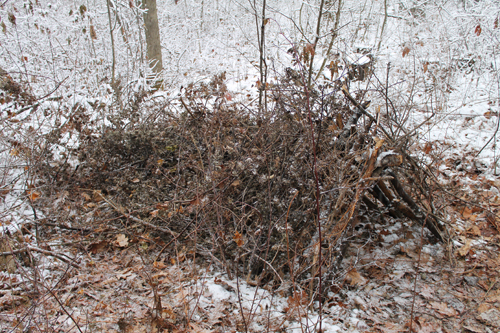 And then at the end another layer of sticks and twigs to keep it from blowing away. awesome information and great visual help too. 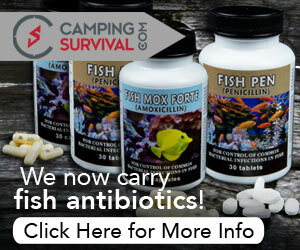 thank you so very much for sharing this important survival tool. “doing the right thing can never be wrong.” keep up the good work! any type of “packing” material is a tremendous help as well, eg:mud, snow! At first it will be chilly but as soon as your body heat is in there it will neutralize and become very comfortable. Definitely try this again. great ideal for cool and cold weather. I would not want to try this in the summer time as in our area you will become chigger and tick bait. Also a particulate mask will help those who have allergies to leaf molds. Very good info. Timewise, how long did it take to construct this? Tom Brown…the guy you refer to early in this post, is a prince and has been around for a very long time. I have four of his books that I bought when living and working in California in the early 80s (over thirty years ago). I still refer to them. Folks should recognize that a debris hut is “survival” not “club med” and in severe conditions it likely won’t be terribly comfortable; but you’ll still be breathing (though shivering) in the morning when done correctly! I have been bitten by a brown recluse spider in a shelter of this type. Thanks for the pics on this one! This type, more or less, is my go-to for the quick and easy shelter. 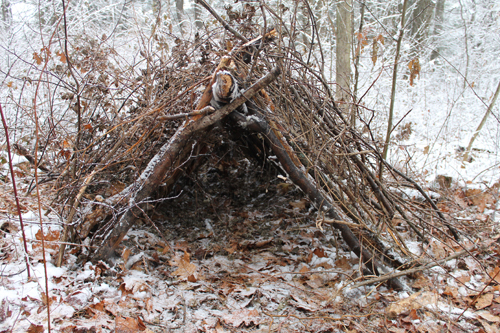 Actually right now I am building a larger wikiup type earth shelter – which is also depicted in Tom Brown’s Field Guide to Living with the Earth – and built one of these in about 15 minutes when it looked like I was going to run out of daylight to build my larger, more permanent shelter. – Lay your bedding first. This will make it much easier than crawling around inside and stuffing it in, possibly knocking down your ribs. I usually make my Nest larger than the inside of the shelter just to be sure, plus, it helps seal the bottom. – More insulation is always better. When you think you have enough, you are about halfway there. Just make sure your ‘ribbing’ is sturdy. – George mentioned it above but to expand on his comment; Where I usually go, there is TONS of Rhododendron which is great for bedding and adding to the insulation mix. 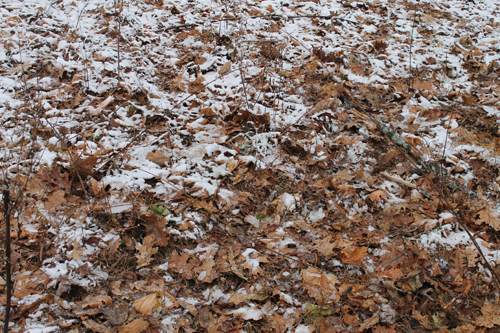 Adding bundles of twigs in between the layers of leaves creates more dead space = more trapped warm air. Just be sure to cover the sticks with more leaves, otherwise it is wasted. – Bark and/or moss make a great top layer. Anyway, those are my little nuggets of wisdom. As usual, great article, E! Thanks for writing this! We are going to try this this winter. Do you think the shelter could be modified to fit 2 and still be as effective? Another great post. the pics are great for explaining everything along the way. I’ve only got one gripe about the article. While I respect him and greatly appreciate alot of what he does and teaches, I believe that saying Tom Brown Jr is the inventor of the debris hut is a bit far reaching. White Mountain Apaches here in Arizona were using similar debris huts for a couple years before Tom Brown Jr or Sr for that matter were ever gracing our presence here on earth. Mr. Brown may have introduced this type of shelter to the modern”survivalist” world but I’d guess that he did not invent it as a shelter. That said, again, another great article. Still appreciating what your doing here brother! Great comment. Yes you are correct. I misspoke in that I called Mr. Brown the inventor of the debris hut. He did learn this from an Apache. What I meant was that he was the one to bring this to the popularity we see today. On page 13 there is a version of the debris shelter shown and noted as the “one night” shelter or “scout master”. the books description does not go into the merits of how much debris to add and such but the general idea is there. With a publishing date of 1914, the shelter pre-dates Mr. Brown by nearly 40 years at a minimum. The A-frame shelter (which this book describes) is still different from the debris hut — most notably in the size and amount of debris. 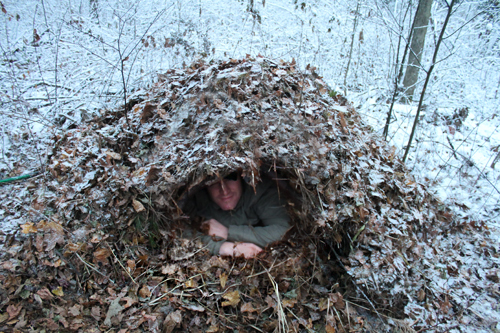 Debris huts are designed to just fit the occupant inside and to be fully surrounded by debris ( much like a leaf sleeping bag). A-frames are typically much larger and allow for sitting up and movement inside the shelter. I really appreciate the pics. the contrast of the snow really helps to see the build. We rarely get snow where I live so it’s tough to seperate the materials from the background. 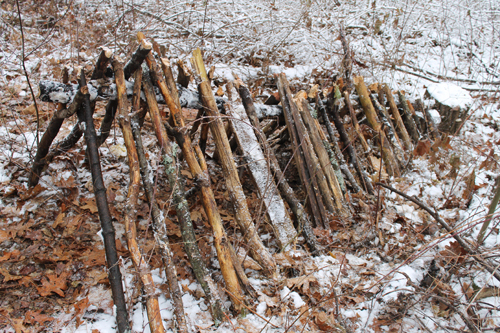 Building a winter A-frame ( which is what this is generally called) you usually want to scrape it down to bare ground and build it on the soil. You want to be between the ground and the insulation. If there is SNOW pile a bunch of it on top. That is also insulation. A single candle will heat it if you get it tight to prevent drafts. You do not want it OVERLY warm to prevent dripping. As illustrated you are laying on wet l;eaves and some snow, which just wets you and causes you to get cold soaked. A-Frames are one of the FASTEST shelters to build. BUT you have to have materials on hand and ready to go. I used to teach arctic survival, and the A-Frame has been a standard shelter for centuries. Probably thousands of years, in forested lands. Having grown up in Tucson, I’m not sure you are going to find enough debris to do this unless you are on Mt. Lemon. 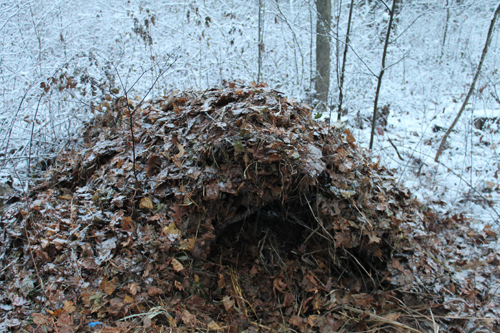 It takes a LOT of leaves to construct one of these shelters correctly. So if you are in an area where there are enough leaves, I don’t think you will have as many thorny bushes because you will be a different elevation. Make sense? For the desert floor, maybe if you decimated a bunch of creasote bushes? They will still have a lot of airspace and not provide great insulation I would think. Fortunately fire building materials are abundant. 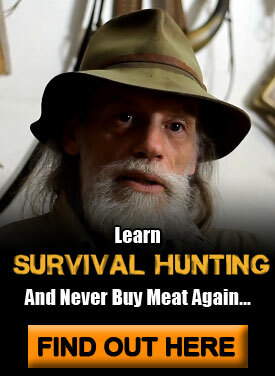 Thanks for the suggestion…not bear proof though. Emergency dwelling but I think I would build a second one inside a hillside or a gully with a roof top if I needed something longer but gullies have meltdowns. I would also suggest that you look for several trees that form a circle or a block. If one could locate such a base with pairs of trees less than a foot apart, one could fill in the space between the two trees with logs, grass and dirt to build a mud house for longer periods with a Debris Hut inside. The smaller the space the warmer the bed. One could also place a Debris Hut inside an igloo. How about a small Debris Hut inside even a larger Debris Hut. Second suggestion, if one had to build a Debris Hut, don’t take your boots off and place the pillow over your heart when you sleep. If the heart is warm the rest of the body is warm enough to survive. Adam and Eve beat every one out in copyright issues. I do believe that the Apache, Commanchero, Cree and others, built their leans up in the trees. They would also select pliable trees to bend over in loops to build a hut and pliable branches to weave in and out of the loops. This would allow for more movement. An emergency hut can even be made by bending down the boughs of the pliable evergreen trees and staking them. Plus, the evergreen allows for one to scramble up the tree if need be. The safest, but slowest, method would be the mud hut made by placing logs, branches, leaves, sand, dirt, in between pairs of trees that are strong enough to hold it all in. If one was in a pack of travellers, this type of building can be extended and extended, plus, one can build back to back. I now I owe a lot of aboriginal ways to my Grandfather Lambert Joseph Wigle. It is said that I am part Spanish American/English/French version of a diluted Commanchero/Commache. He even taught me how to get out quicksand and there is none in Canada. But, thanks for ALL the input no matter where or who it comes by. If you have do not have an axe then a Debris Hut would do whether in a gully, inside a hill, etc. But, one could fortify whatever was being built with rope, whether they had an axe or not for staking, by making their own cord. This is done by stripping the bark off a pliable branch. 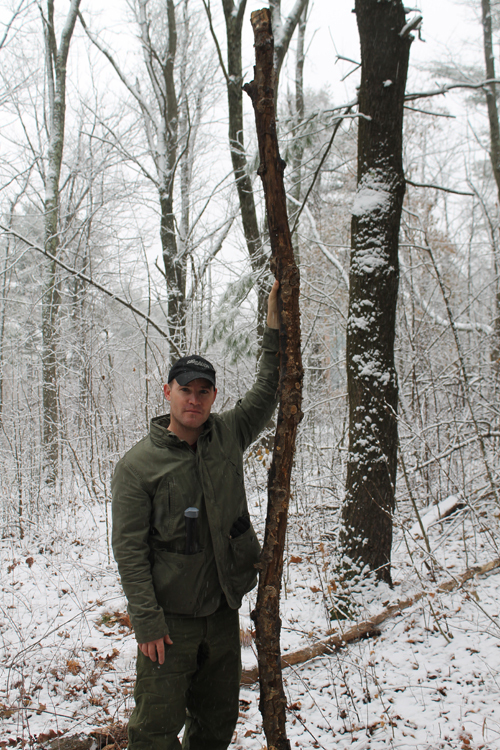 You want to harvest the soft inner bark on the other side of the hardened bark that you have pulled away from the branch. You can either braid these strips or you can just loop the ends into a knot then tie. Snow would help to keep the leaves in place. Myself, I would make it a little longer, high enough for me to turn from stomache to back (which I do several times in a night) but more importantly, I would allow more room down by the feet and pack that area up with leaves by at least two feet. The feet are far away from the heart and needs that extra stuffing. Also, nature can fool you. Hypothermia sets in and the body heats up to try to help and as it does the person starts to take off their clothes…they get very sleepy, dreamy and euphoreic. Take a therometer and write down the inside heat which would give a more exact conclusion of this experience. In cold, I take a small sleeping bag to place inside a large sleeping bag. The smaller one will need to be aired every day as the body sweats. I was hoping to hear from someone from much farther north, thank you! For someone like myself who is used to spending at least part of the winter in the northwoods of Minnesota, 20 degrees sounds quite warm! I would be quite confident in my typical snow gear at 20 degrees, but what about -20 or lower when you can expect most everything to freeze in short order? Your idea of layered shelters is exactly what I was looking for – something to knock down the wind before it hits your shelter is going to be paramount in this type of situation. I was thinking through possibly setting up in a small stream bed (typically would be dry in the winter) or other form of gully, but that’s not always available depending on where you’re located. I also hadn’t thought through “bear proofing”, and your idea of having an evergreen available to climb up sounds brilliant (at the very least, it would provide a very adequate defense for wolves). Again, thank you for your perspective! Most excellent information. Definitely helps put it all together with the pics. Thanks! 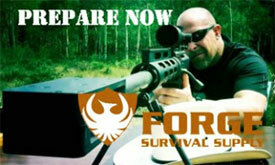 I am new to prepping…hear about an event in Daytona Beach, close to where I live that is a prep ad gun expo. Anyone know anything about it? Is it good? Thanks for sharing your knowledge. I just read it with my 17yr old. ! quesion; Do you have the foot end up on a stump and then another stump blocking it from slipping off? I can’t really make it out. I was surfing on Youtube about shelters. Later that nite, I remembered something about two or three men dying from going out unprepared. One young man was mush like the one above building this shelter. It was said that he may have been drinking but I didn’t think so. Drinking keeps the heart and brain active but it also makes one sleepy. He was found with his coat off which means that he had suffered from hypothermia wherein the body gives off so much heat in a desparate attempt to keep the body alive from freezing that it fools a person into thinking that he really is too warm. Taking off mitts, socks and shoes will also increase hypothermia. And, it is a beautiful way to die…very dreamy. I remember hypothermia & my brother kicking me. 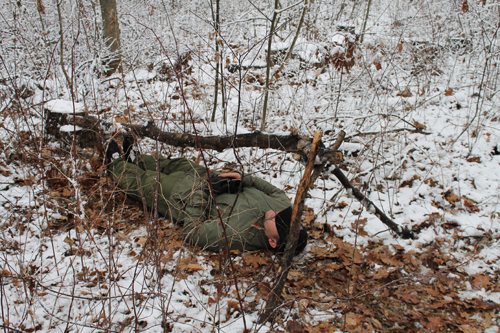 The second part about hypothermia is that the eyelids start to stick to the eyeballs. Someone phoned me once for help about a man treking across the snow possibly in the Artic. He had no glasses with him and he was going “snow blind” meaning that the glare of the sun was hitting the snow and the light was aimed at his irises. My suggestion was that he used his own snot, flowing freely, possibly from hypothermia and glue over one eye. The snot would act as an insolation. Then, after ten to fifteen minutes peel off the snot and place it on the other eye. Repeat this procedure often. Once the eyeballs are heated up. One can snot one eye and pull part of a sleeve over the other with enough room to see. It’s better to have a hood that pulls out as the light shoots up & mite block it. Fantastic article! I have been researching this topic a lot recently, and yours is one of the better articles I have seen. The picture sequence helps so much. I’m going to include a link back to it in one of my posts on the subject. The importance of tinted googles in the “bag” can not be stressed enough. And, remember when you don’t have googles & you start to loose your vision, that you need to pull one eyelid down before applying the snot from your nose (or poo if need be) cover it with cloth from your sleeve or whatever and wrap it around your head or use your hand to save at least one eye. Then alternate. I would also suggest that each person carry one or two stones in their “bag” to warm up water after the stones have been heated by fire. Just make a well in the harden snow and add the stones all at once and you mite have enough water to wash your face & backside. 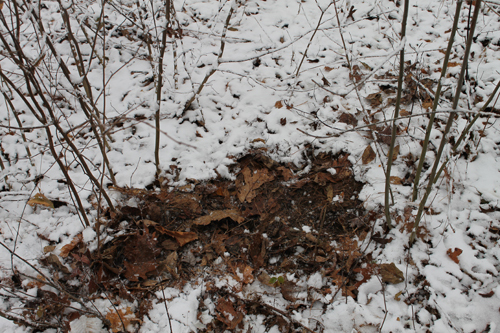 A cloth canvas or material should be placed down on the welled out ground first before adding the hot stones and snow. The aboriginals use to do it on thick ice sheets so they could take a bath or cook a meal/tea. If a Wolf Pack started digging in that to get you good bye. A lot of people are getting killed by Feral dogs in packs now that people aren’t automatically shooting stray dogs as the Pioneers did. 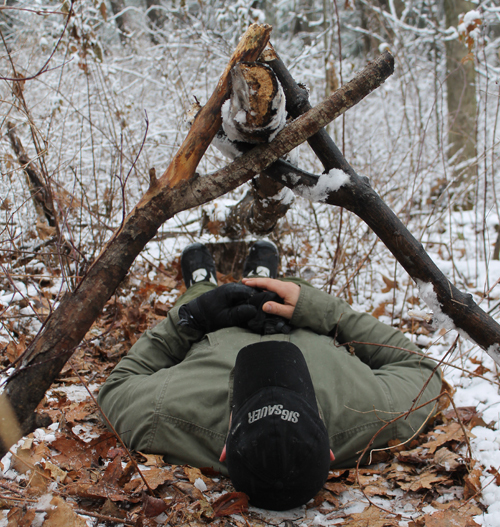 Being able to start a fire and build a shelter, are the two most important cold-weather, survival skills you can possess! They will save your life. They saved mine once, while Elk Hunting, in a Colorado Wilderness Area. I got caught in the worst blizzard I’ve ever been in. It went from a beautiful, crystal-clear morning, to cloudy and snowing, to an absolute BLIZZARD, in a matter of hours! I was in the middle of a wilderness area, at 10,500 feet, with no horse! The only thing that saved my life, was getting that fire started and building that shelter, to ride out the storm. If going into any wilderness area, always have a couple of Bic Lighters and lots of 550 Survival Cord, in your pocket! They’re worth their weight, in Gold! Another good insulator if you have it handy, is to put a few layers of newspaper over the ribs before you load them up, but make sure the floor is good first. News paper also makes a good entrance cover. if u dig a trench before u place ur bedding down u will make ur self more leg and arm room. not to mention the lil critters that live below the snow and debris. u will want to clear them out before u laydown bedding material. try the rule of thirds. first try to keep the ribs even with the ridgepole. As you are building the shelter put lots of leaves, grasses etc over the ridgepole and under the ribs. Do the same for the sides were the ribs meet the ground. really stuff this full on these 3 points for a warmer shelter. After putting about a 12 inch layer of leaves cover it with small thin branches and then add another foot of debris. Do this 3 times and you will sleep well in temps far colder than 20 degrees. i know this becuase i slept out in 15 degrees in northern Idaho in the winter. i woke up on the morning being too hot and sweaty and got cold when I first went outside. Any tips on avoiding biting insects, like fire ants. In Texas, even in winter, it can get cold, but the ground doesn’t freeze. If you start stirring the material on the ground, you will find the ants underneath. If you don’t, you will find them later, biting you. My first thought was, “You’ll never get me to lie on the ground in the woods.” So any advice? One of the best ways of ridding shelters of insects is through “smudging”. Basically, find a flat stone (or a hollowed-out chunk of wood) and place some hot coals from a fire on it. Then place a handful of green aromatic leaves like cedar, garlic mustard, spruce, sage etc on top of the coals. The hot coals will cause the green leaves to smoke. Insects hate this aromatic smoke and when placed in the shelter will drive them out leaving you with a insect-free evening of sleep. It helps to block the entrance while the smudger is doing its magic. This will help the smoke more effectively permeate the shelter. Just be careful not to get these hot coals too close to your shelter’s debris so as not to cause a big fire. 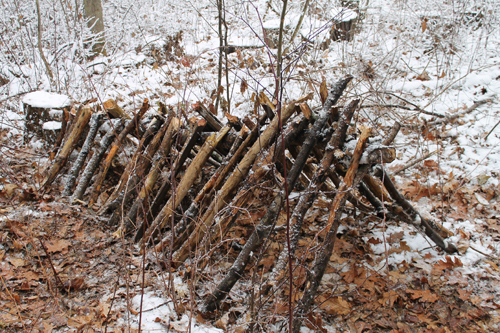 Great shelter… But this guy who “invented” it must be one old dude… This has been in Boy Scout handbooks for ages. use pine boughs underneath, then cleverly disguise them with debris! If you have time when you build one of these, it is a good idea to just weave a few branch’s into a door for the front . It is done the same way they weave wattle and daub walls. I just wanted to add that before placing the ridge pole if you scraped a trench the same length as you. 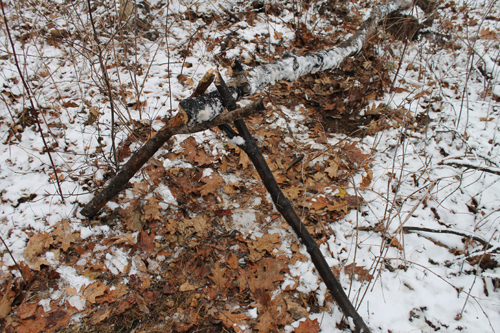 Then built a fire in it of twigs, leaves anything to warm the ground first. Then after it had burnt out covered it back over with earth. Then build the shelter the stored heat would help make it more bearable on very cold nights. I think what you guys post on here is a great help in building a great knowledge background to have. Craig, most likely it was a caveman. We will probably never know who first made it. These types of shelters, along with double lean tos are pretty good. Easy to make and offer protection.